Raise your hand if you became an apprentice electrician or journeyman electrician to take tests and spend weeks studying for the electrical exam. I didn’t think so. Most guys that I deal with haven’t had to worry about test taking since high school or college. 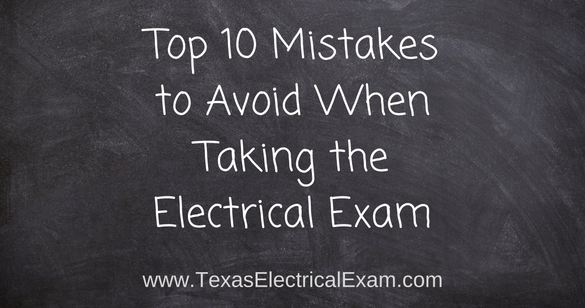 So this blog explores 10 mistakes to avoid when taking the master's electrical exam and the journeyman electrical exam. Mistake #1. Cramming for the electrical exam just days before your scheduled test. Research suggest that spacing out your electrical practice exams is better than lumping them together into one long study session. Condensing your study periods or cramming for the electrical exam will put too much pressure on you yourself and will almost guarantee silly mistakes. Mistake #2. Spending too much time on 1 electrical question. If you can’t figure out this question and you’re stuck on it, mark it and move on. The electrical exam is timed and you can’t afford to sit on one question too long. Marking the question will allow you to return to it later after you have answered the other questions thus giving you a better chance of passing the electrical exam. Mistake #3. Only using the index of the electrical code book or only using the table of contents for answers during the electrical exam. Learn to use both portions of the electrical code book and also learn the layout of the electrical code book. Knowing the electrical code book will help you save time. Mistake #4. Leaving questions unanswered. Always mark a hard question and return to it later. Remember, an educated guess is better than no answer at all. Studies have shown that if you must guess, choosing answer B or C in the electrical exam is usually a better bet than answers A or D.
Mistake #5. Not reading the questions, directions and answers thoroughly. When you get a question it is very important that you read the directions as well. Sometimes you are asked to either IGNORE or CONSIDER exceptions in the electrical code book. Not reading the text properly can cause you a few points. Mistake #6. Leaving the easier electrical exam questions until the end. For some reason many people want to leave the easier questions until after they tackle the harder ones. It doesn’t make sense. Why risk running out of time to answer the easy points? Mistake #7. No taking simulated electrical exams in conditions similar to the actual electrical exam environment. The electrical exam is computer based, about 80% of electricians preparing for the electrical exam go to a book for study chapters and practice exams. Make sure to incorporate a software based or online based simulated electrical exam specially if you are uncomfortable or new to using the computer. Study in different environments such as the library where you don’t have control of the environment, temperatures or noise/lack of noise. Mistake #8. Taking an unapproved electrical code or electrical reference book. Your electrical code book can be highlighted and tabbed. Do not feel that you have to highlight everything you read. Too many written notes are usually not allowed in the electrical exam room. The tabs on your book must be PERMANENTLY affixed. That means if they try to remove the tab it should tear your electrical code book page. Make sure you read your state’s candidate information bulletin to see which version of the electrical code book is allowed. For example, Texas only allows the SOFTBOUND NEC book. Mistake # 9. Not using a straight edge or ruler for looking up information on electrical code tables. Do you want to know how many guys have face-palmed in our live electrical exam prep seminars when they get the wrong answer simply for misreading an electrical code table? Too many and it is so sad because their calculations are correct, however the data they got from the tables were from the line above or under. Use a ruler or the edge of your paper! This is the worst type of mistake because it is so easily avoidable. Mistake # 10. Using the wrong calculator. Make sure your calculator buttons are the right size for your fingers, you don’t want the buttons to be too small, you’ll easily type the wrong number. Also your calculator should be battery operated, do not bring a solar calculator to your electrical exam, it will not help you. Also don’t bring calculators that aren’t allowed in the center. You’ll know which are allowed by reading your Candidate Information Bulletin. Studying late at night is not ideal, you will often forget what you have just learned and lose much needed sleep. Try not to study for more than 2 hours at a time. Finally, avoid drinking too much coffee or alcohol the night before or a few hours before the electrical exam. I know I just dumped a whole lot of information on you just now but most of this is common sense and easy to implement. You can start applying the rest of these tips now while you are preparing for the electrical exam. Once you receive your approval letter from TDLR or your electrical licensing department, make a plan to pass. By planning carefully, you can avoid making silly mistakes on the electrical exam. That’s what this blog is here for, to help you find the best resources to help you pass the electrical exam. If you have any questions, please feel free to send us an e-mail and we’ll get back to you. As always, if you have any exam prep tips you feel could be used on this website, send us and e-mail so we can share your tips with other electricians. Posted in Exam prep and tagged 2014 nec, app for electrical calculation, easy index for 2014 nec book, electric exam, electrical contractor license, electrical exam prep, how to pass the exam, journeyman electrical exam, journeyman psi exam., last psi exam test, national electric code book, texas journeyman exam.